Introduction: Chemical substances used for prevention of dental caries are known to have many side-effects. Thus, natural products should be explored for their anticaries action. Objectives: To prepare 5% and 20% concentrations of ethanolic and water extracts of guava leaves and to assess their activity against Lactobacillus acidophilus. Materials and Methods: In vitro experimental study was conducted in Department of Biosciences. Ethanolic and water extracts of guava leaves were prepared using Soxhlet extractor. Two concentrations 5% and 20% weight/volume of both extracts were prepared. Test organism L. acidophilus Microbial Type Culture Collection 447 was obtained in lyophillized form. After revival in nutrient broth, bacteria were grown on Lactobacilli de Man, Rogosa, Sharpe agar for further experiment. 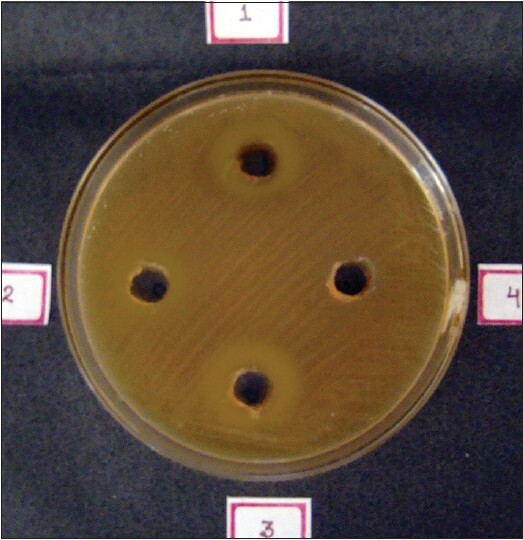 Antimicrobial testing of extracts was done using Agar well-diffusion method. Ten plates each were prepared for both extracts. Chlorhexidine (0.2%) served as a positive control and distilled water as a negative control. Results: Mean zone of inhibition produced by 5% and 20% ethanolic extract was 11.2 mm and 14.1 mm respectively and by 5% and 20% water extract was 1.6 mm and 5.1 mm respectively. Statistical analysis of results using one-way ANOVA and post-hoc Tukey's test revealed that activity of 5% ethanolic extract and 5%, 20% water extract was significantly less than that of 0.2% chlorhexidine. There was no statistical difference in efficacy of 20% ethanolic extract of guava and 0.2% chlorhexidine (P = 0.270). Conclusion: Ethanolic and water extracts of guava leaves possess antibacterial activity against L. acidophilus with 20% ethanolic extract being as efficacious as 0.2% chlorhexidine. One of the main predisposing factors for the onset of dental caries is the presence of bacterial species that can lower the plaque pH to or below critical pH. It is well established that dental caries causing microorganisms inhabit the dental plaque. Out of 300-or-more species of microorganisms inhabiting the dental plaque  lactobacilli have been found to be present in high numbers in superficial and deep carious lesions. 30% of the clones belong to Lactobacillus acidophilus group. Lactobacilli act on carbohydrate and produce lactic acid which may lead to demineralization of tooth. Agents having activity against L. acidophilus can cause a reduction in the occurrence of dental caries. Many products such as antibiotics including penicillin, ampicillin, tetracycline, erythromycin and vancomycin are very effective in preventing dental caries in vitro as well as in vivo. However, excessive use of these anticariogenic agents can result in alterations of the oral and intestinal flora and can cause undesirable side-effects such as the development of bacterial tolerance, vomiting, diarrhea. Gold standard for the prevention of plaque accumulation and caries activity is Chlorhexidine, which has shown antibacterial activity against L. acidophilus. , Chlorhexidine usage is associated with many side-effects such as staining of teeth, altered taste sensation, stenosis of the parotid duct. ,, Therefore, there is a need to search antimicrobial agents that are specifically active against oral pathogens and also safe for human beings. A number of studies have investigated the activity of various parts of guava plant extracts against specific oral pathogens mainly associated with periodontal diseases and oral malodor while others have focused on the ability of the products to inhibit the formation of dental biofilms by reducing the adhesion of microbial pathogens to the tooth surface, which is a primary event in the formation of dental plaque and the progression to tooth decay and periodontal diseases. The present study was carried out with the research hypothesis that guava leaves possess antimicrobial efficacy against cariogenic bacteria such as L. acidophilus. The aim of the study was to assess the antibacterial efficacy of ethanolic and water extracts of Guava leaves at 5% and 20% weight/volume (w/v) concentrations against L. acidophilus. The present in vitro experimental study was conducted in the laboratory of Department of Biosciences, Maharaja Ranjit Singh College, Indore (M.P.). The ethical clearance had been obtained from the Ethical review committee of Sri Aurobindo College of Dentistry, Indore. Test organism was L. acidophilus (Microbial Type Culture Collection [MTCC] 447), which was obtained from MTCC gene bank, Institute of Microbial Technology, Chandigarh, India. L. acidophilus was obtained in lyophilized form in a glass vial. The revival of bacteria was done using nutrient broth having a pH of 7.4. The nutrient broth containing bacteria was kept in an incubator at 37°C for 48 hours. This preliminary study considered only the qualitative analysis of activity of Guava leaves extract against L. acidophilus. Therefore, the two higher concentrations, that is, 5% and 20% w/v were tested for antibacterial activity. The plant specimen (Leaves of P. guajava Linn.) for the proposed study was collected from the botanical garden of Devi Ahilya Vishwavidyalaya in the month of May 2013. Leaves of P. guajava L. (Myrteceaae) were cleaned and dried in an oven at 60°C for 5 hours. The dried leaves were then grounded to powdered form. Preparation of the extract was done using Soxhlet extractor. The extracts were filtered using Whatman no. 4 filter paper and then dried in a rotary evaporator for 5-6 hours at 60°C. The dried extract was converted into a powder form which was utilized for the preparation of desired concentrations of the extracts. The required concentrations of 5% and 20% ethanolic extract were prepared by adding 0.5 g and 2.0 g of powder respectively in 10 ml of ethanol. Similarly for the water extract the same amount was added in the distilled water. The extracts were stored at 4°C in sterile bottles. The antibacterial activity of guava extracts was checked by agar well-diffusion method which was performed on the next day of preparation of the extract. Antibacterial testing was carried out in laminar airflow to avoid contamination by other organisms. A measured amount, that is, 0.5 ml of suspension of inoculums having 3 × 10 8 L. acidophilus/ml (estimated using Mc Farland standard) was streaked on de Man, Rogosa, Sharpe (MRS) agar. Two groups of plates were prepared: Ethanolic extract group and water extract group. In each group, there were 10 plates. In all the plates, 4 wells were punctured in agar with the help of well borer. The 4 wells prepared in ethanolic extract group were filled carefully with 0.08 ml of 5% ethanolic extract of guava, 20% ethanolic extract of guava, 0.2% chlorhexidine (positive control) and sterile distilled water (negative control). Similarly in water extract group, the wells were filled with 5% water extract of guava, 20% water extract of guava, 0.2% chlorhexidine and distilled water. All the plates were kept in an incubator at 37°C for 48 hours. After 48 hours zones of inhibition were measured. Statistical analysis was performed using Statistical Package for the Social Sciences (IBM SPSS Statistics 20.0, Chicago). ANOVA test was applied to know the difference between the groups such as 5%, 20% ethanolic extract and 0.2% chlorhexidine and 5%, 20% water extract and 0.2% chlorhexidine. Post-hoc analysis was employed to specifically find that between which groups did significant difference existed. P < 0.05 was considered as statistically significant. The present study was conducted to assess the efficacy of Guava leaves extracts on L. acidophilus using agar well-diffusion method. 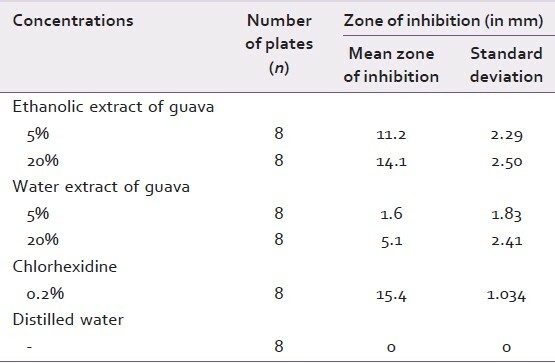 Mean zone of inhibition exhibited by 20% and 5% ethanolic extract was 14.1 mm and 11.2 mm [Table 1], [Figure 1]. Water extract at similar concentrations exhibited 5.1 mm and 1.6 mm zones of inhibition [Table 1], [Figure 2]. Highest mean zone of inhibition was exhibited by 0.2% chlorhexidine (15.4 mm) [Table 1], [Figure 1] and [Figure 2]. The antibacterial efficacy of ethanolic extract of guava leaves at 5%, 20% concentration and 0.2% chlorhexidine was compared using one-way ANOVA (F = 11.390, P = 0.000) [Table 2]. Results that showed a significant difference were further analyzed for statistical significance between specific groups using Tukey post-hoc analysis [Table 3]. There was a significant difference between the efficacy of 5% (11.2 ± 2.29 mm) and 20% (14.1 ± 2.50 mm) ethanolic extract and 0.2% chlorhexidine (15.4 ± 1.034 mm) (F = 11.390, P = 0.000). On post-hoc analysis, it was revealed that the efficacy of 20% ethanolic extract (14.1 ± 2.50 mm) was not significantly different than 0.2% chlorhexidine (15.4 ± 1.034 mm) P = 0.271. However, the efficacy of 5% ethanolic extract (11.2 ± 2.29 mm) was significantly lower than 0.2% chlorhexidine (15.4 ± 1.034 mm) (P =0.012). There was a significant difference in the activity of 5% (1.6 ± 1.83 mm) and 20% (5.1 ± 2.14 mm) water extract and 0.2% chlorhexidine (15.7 ± 1.034 mm) (F = 132.993, P = 0.000) [Table 4]. Post-hoc analysis revealed that the activity of 0.2% chlorhexidine (15.7 ± 1.034 mm) was significantly higher than 5% water extract (1.6 ± 1.83 mm) as well as 20% water extract (5.1 ± 2.14 mm) of guava leaves. The effect of water and ethanolic extract of guava were found to be dependent on the concentration. 20% concentration of water and ethanolic extracts was significantly higher than 5% concentration [Table 4] and [Table 5]. In this study extracts of guava leaves were tested against L. acidophilus. The guava leaves had been reported to contain essential oils, flavonoids, saponins, nerolidiol, β-sitosterol, ursolic, crategolic and guayavolic acid. These substances were reported to have strong antibacterial action. Prabu et al., have demonstrated Guajaverin, a flavonoid in the methanolic extract of leaves of guava that exhibited strong antibacterial activity against caries causing Streptococcus mutans. Thus, this study attempted to evaluate the efficacy of guava leaves, a rich source of antibacterial substances against caries causing L. acidophilus. In the present study, agar well-diffusion method was employed for microbiological assay that had been reported to be more sensitive than other methods like disc diffusion method. 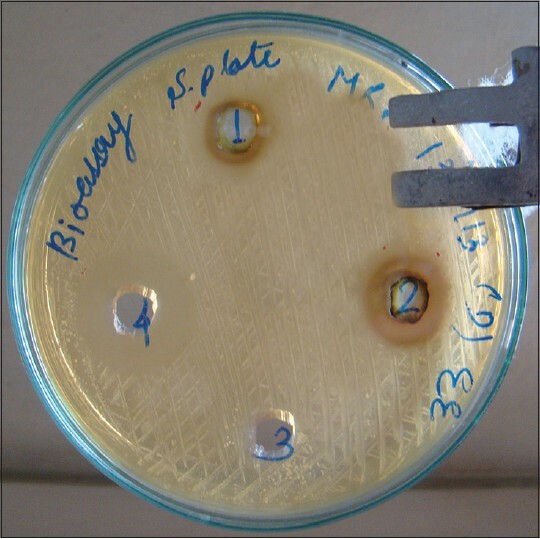 L. acidophilus was cultured on MRS agar as per the recommendations of MTCC Chandigarh. Results of the present study demonstrated almost similar efficacy of 20% ethanolic extract of guava leaves and 0.2% chlorhexidine. Apart from leaves, extracts from other parts of guava had also been found to possess antibacterial activity. Ngoroyemoto et al., studied the ethanolic and methanolic extracts from roots of guava and found these to be effective against L. acidophilus. Similarly, the difference in the activity of 5% and 20% water extract of guava leaves against L. acidophilus can be attributed to the difference in the concentration of different antibacterial compounds present in the 5% and 20% concentrations of water extract. The present study evaluated qualitatively the antimicrobial potential of guava leaves extract against L. acidophilus. However, further quantitative research is needed to know the minimum inhibitory concentration and to evaluate the effectiveness and safety of guava extracts in vivo. The ethanolic and water extract of guava leaves possess antibacterial activity against L. acidophilus with 20% ethanolic extract being as efficacious as 0.2% chlorhexidine. Moses J, Rangeeth BN, Gurunathan D. Prevalence of dental caries, socioeconomic status and treatment needs among 5-15 year old school going children of Chidambaram. J Clin Diagn Res 2011;5:146-51. Cura F, Palmieri A, Girardi A, Martinelli M, Scapoli L, Carinci F. Lab-Test(®) 4: Dental caries and bacteriological analysis. Dent Res J (Isfahan) 2012;9:S139-41. Loesche WJ. Role of Streptococcus mutans in human dental decay. Microbiol Rev 1986;50:353-80. Byun R, Nadkarni MA, Chhour KL, Martin FE, Jacques NA, Hunter N. Quantitative analysis of diverse Lactobacillus species present in advanced dental caries. J Clin Microbiol 2004;42:3128-36. Kleinberg I. A mixed-bacteria ecological approach to understanding the role of the oral bacteria in dental caries causation: An alternative to Streptococcus mutans and the specific-plaque hypothesis. Crit Rev Oral Biol Med 2002;13:108-25. Saraya S, Kanta J, Sarisuta N, Temsiririrkkul R, Suvathi Y, Sanranri K, et al. Development of guava extract chewable tablets for anticariogenic activity against Streptococcus mutans. Mahidol Univ J Pharm Sci 2008;35:18-23. Biswas B, Rogers K, McLaughlin F, Daniels D, Yadav A. Antimicrobial activities of leaf extracts of Guava (Psidium guajava L.) on two gram-negative and gram-positive bacteria. Int J Microbiol 2013;746165. Mailoa MN, Mahendradatta M, Laga A, Djide N. Antimicrobial activities of tannins extract from guava leaves (Psidium guajava L.) on pathogens microbial. Int J Sci Technol Res 2014;3:236-41. Duss C, Lang NP, Cosyn J, Persson GR. A randomized, controlled clinical trial on the clinical, microbiological, and staining effects of a novel 0.05% chlorhexidine/herbal extract and a 0.1% chlorhexidine mouthrinse adjunct to periodontal surgery. J Clin Periodontol 2010;37:988-97. Bagis B, Baltacioglu E, Özcan M, Ustaomer S. Evaluation of chlorhexidine gluconate mouthrinse-induced staining using a digital colorimeter: An in vivo study. Quintessence Int 2011;42:213-23. Frank ME, Gent JF, Hettinger TP. Effects of chlorhexidine on human taste perception. Physiol Behav 2001;74:85-99. Ismail M, Minhas PS, Khanum F, Sahan VM, Sowmya C. Antibacterial activity of leaves extract of guava (Psidium guajava). Int J Res Pharm Biomed Sci 2012;3:1-2. Jayakumari S, Anbu J, Ravichandiran V, Nithya S, Anjana A, Sudharani D. Evaluation of toothache activity of methanolic extract and its various fractions from the leaves of Psidium guajava Linn. Int J Pharm Bio Sci 2012;3:238-49. Elekwa I, Okereke SC, Ekpo BO. Preliminary phytochemical and antimicrobial investigations of the stem bark and leaves of Psidium guajava L. J Med Plant Res 2009;3:45-8. Jebashree HS, Kingsley SJ, Sathish ES, Devapriya D. Antimicrobial activity of few medicinal plants against clinically isolated human cariogenic pathogens-An in vitro study. ISRN Dent 2011;541421. Esimone CO, Nworu CS, Ekong US, Iroha IR, Okolin CS. A case for the use of herbal extracts in oral hygiene: The efficacy of Psidium guajava-based mouthwash formulation. Res J Appl Sci 2007;2:1143-7. Gutiérrez RM, Mitchell S, Solis RV. Psidium guajava: A review of its traditional uses, phytochemistry and pharmacology. J Ethnopharmacol 2008;117:1-27. Prabu GR, Gnanamani A, Sadulla S. Guaijaverin a plant flavonoid as potential antiplaque agent against Streptococcus mutans. J Appl Microbiol 2006;101:487-95. Valgas C, Machado de Souza S, Samania EF, Samania A. Screening methods to determine antibacterial activity of natural products. Braz J Microbiol 2007;38:369-80. Ngoroyemoto N, Mushore J, Dhliwayo J, Dzomba P. Antimicrobial properties of methanolic, water and chloroform extracts of Psidium guajava (L) roots. Int J Green Herb Chem 2013;2:713-22. Cushnie TP, Lamb AJ. Antimicrobial activity of flavonoids. Int J Antimicrob Agents 2005;26:343-56.